You will be given a reference e-book to read which has 330 pages And the test will be based on that e-book , you can take the test only after 10 days Of &nbsp;purchase. A project leader is someone who leads a team when a certain project is being carried out. He performs a lot of tasks including binding all the people within his team for a common goal. If you want to receive your project leader certification in the future, then you have to keep in mind that project leadership is defined by experts as an ability to complete certain tasks or accomplish a project with the help of others. The entire project leadership concept has essential elements including a vision of the end result, a more realistic timetable, a persuasive reason to reach goals and an ability to persuade a willing team to continue reaching a goal. Before taking a project leader course, you have to conduct a research about the skills needed for an effective leader. This will help you identify the specific skills that you need to hone. According to experts, an effective project leader must have a vision and skills in listening and questioning, influencing, empowering, strategizing, communicating and team building. A good leader is someone who can lead effective communication within the team, develops tasks list while listening to the suggestions of his members, guides the entire team to reach a consensus and guarantees that all the needed details in a project are properly distributed to all the members of a team. Other skills and qualities that make up a good leader as stated by experts are enthusiasm, integrity, competence, empathy, cool under pressure, problem-solving skills, team building skills and skills in effectively delegating tasks. Taking part in a project leader certification program is possible online since an ISO certified company named as Brainmeasures is now available for career-oriented people. Brainmeasures is filled with expert and professional people and its different programs including that which is primarily designed for aspiring project leaders are made by such experts. The project leader online test is also guaranteed to work in assessing your skills as an effective leader as this is also created with the help of reputable and formidable project leaders. Passing the online certification exam offered by Brainmeasures which is designed for project leader practitioners can help you get a more stable employment in the future as you can already prove that you have good leadership skills through your hard copy certificate. You will learn all these topics while gaining other information necessary in becoming an effective project leader when taking up the project leader certification course offered by Brainmeasures. A more detailed syllabus can be accessed by the registered members of the company’s official website. Even if you do not have inherent leadership skills, you should know that you still have a great chance of becoming a good leader by taking up a project leader certification course. 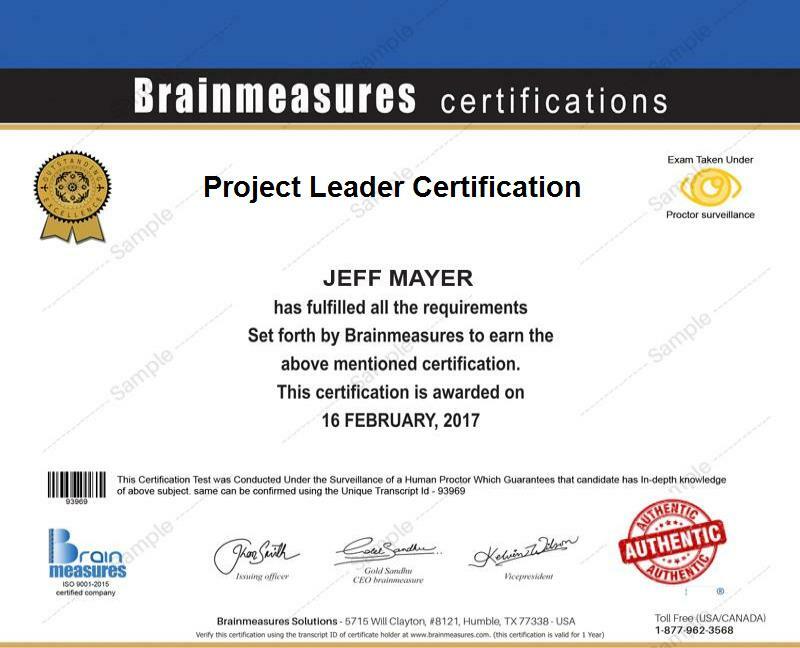 Since Brainmeasures does not have any requirements or qualifications for its project leader certification program, rest assured that you will be admitted into the program anytime. But this certification course is more appropriate for project managers, functional managers, project management professionals, mid-level managers and business leaders who are in charge of leading a project or cross-functional team. Aside from the huge increase in the number of career opportunities for you, being a project leader certification holder can also increase your annual income. An annual income of $61,000 to $121,000 can be expected after you become a certified project leader.